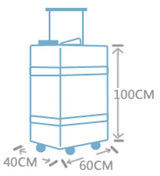 3、The baggage exceeding the forgoing specifications must not be transported as baggage. So, we suggest passengers to take apart and subpackage their baggage, in order to ensure single items of their luggage to be registered meet the restrictions and thus may be checked as normal baggage. If any baggage cannot be separated, the owner shall consign it to Cargo Department of China Southern Airlines. 5、Passengers’ names, detailed addresses and phone numbers should be written on the baggage.